Prostate SR is a health supplement that should be added to your daily nutrition and used regularly for optimal effects. The primary benefit of this product is boosting prostate health and the regular function of the urinary tract. Considering that, the supplement is intended for males, especially those that are experiencing issues with their urinary tract and prostate. The product contains high-quality and carefully chosen products that may work on reducing the need for frequent urination and improve urinating stream. Other potential benefits may include promoting the feeling of an empty bladder and shrinking the size of the prostate. According to the manufacturer, the first benefits may be noticed after six weeks of using Prostate SR.
Who is the Manufacturer of Prostate SR? 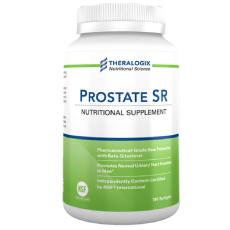 The company that makes Prostate SR is named Theralogix and it appeared on the market in 2002. During more than 15 years of practice, they released 30 different formulations created with the help of specialists. When it comes to prostate supplements, they claim to consult urologists to provide efficient and high-quality products. Theralogix also emphasizes they do not use proprietary blend to ensure maximum transparency. How Does Prostate SR Work? Everything starts when you ingest the softgels as the ingredients slowly get released into your organism. The components of the formula jointly work on shrinking your prostate, which subsequently helps with many symptoms related to benign prostate hyperplasia. Prostate SR works on helping you to start urinating and improves stream strength. The prostate supplement also helps to empty your bladder completely and prevent having the feeling of bladder fullness. Although the product is intended for continuous and long-term use, the time for feeling maximum improvements is set at about three months. Prostate SR Ingredients – Are They Safe & Effective? Saw Palmetto Extract – The berry of this plant is popular for its benefits in promoting prostate health. For starters, it may work on treating enlarged prostate and decrease prostate cancer risk. Males love this supplement as it also works on promoting sexual function and performance and can treat LUT symptoms, such as urination frequency and frequent nighttime urination. Phytosterol Blend – This blend contains 40-50% of beta-sitosterols and the rest is made out of other sterols who may aid in achieving joint goals. One of the benefits is treating BPH while also working on improving immunity, optimizing cholesterol levels and even sexual function. Extra Virgin Olive Oil – Aside from being suitable for cooking, it can also promote bone health and decrease the risk of heart disease. It may also work on improving your skin appearance and might even work on preventing breast cancer. Soy Lecithin – A healthy fat that actually helps in optimizing cholesterol levels. It is also used as an immunity booster and may boost bioavailability of other ingredients. Gelatin – This is an inactive ingredient playing a role in forming the capsule. It is free of BSE (mad cow diseases), but it still comes from bovine, which may make it unsuitable for vegans. Other compounds of the product include carob extract, yellow beeswax, purified water, and glycerin. What are the Advantages of Prostate SR? What are the Disadvantages of Prostate SR? How Should You Take Prostate SR? According to the instructions on the label, you should take two softgels of the supplement every day. You can take them at various times and they do not have to be taken together, but it is preferred to ingest them with food. How Much Does Prostate SR Cost? If you go through the official website, the cost of Prostate SR will be $60. In case you have a healthcare provider the company is working with, they may give you a discount code and the price will be lowered to $50. What Is Prostate SR’s Return Policy? The first thing the manufacturer mentions is that the return policy is valid for 30 days. However, you can’t open the box or use the item to stay eligible for a refund. If the deadline of 30 days passes, you may still expect a refund, but as store credit. In both cases, shipping charges won’t be compensated. Does Prostate SR Offer a Free Trial? There is no testing offer for Prostate SR available at the moment and it doesn’t seem like the manufacturer is planning it soon. Thanks to that and beta-sitosterols, it may help to shrink your prostate in cases of BPH. However, the manufacturer claims it may take up to six weeks for results, which implies you have to be patient. Additionally, the product can provide improvements for up to three months, but the chances of feeling further progress after that are limited. However, you can continue using it for maintaining optimal function of the urinary tract, but keep in mind not to expect significant results when it comes to reducing prostate size. Prostate SR can help to treat symptoms like bladder fullness and weak streams, but pay attention if you are using it with drugs that slow blood clotting as it may interact. Finally, the color of the softgels may vary, but that doesn’t affect the performance. 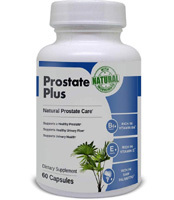 We suggest reading at least several prostate health product reviews as there are numerous supplements to choose from. Your objective should be to find the one that ideally fits your diet and health requirements.